Why The Super® PVA Sponge Mop Really Lasts! * Patented, Durable Double Wringers. That's right, 4 rollers - not 2 rollers like most PVA mops! See photos (below left). 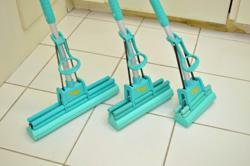 The 4 rollers completely cover the sponge when wringing, to provide a clean, drip-free mop. * Mop Housing is Made from 100% Virgin Plastic. 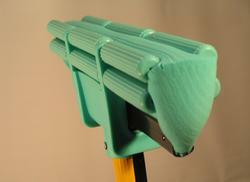 Other mops use recycled plastic which breaks easily or thin, stamped aluminum which has sharp edges. The Super is made for heavy duty, continuous daily use by professionals and consumers. * Aluminum Telescopic Handle is Durable & Adjustable. Unlike other handles that are typically half the thickness, our handles are 1 mm thick. This helps prevent bending and breaking. Simply twist the handle to extend or retract. Lightweight, but heavy duty. Regular handle extends from 39" to 52". Optional extension handle 50" - 73". NOTE: Measurements are made from tip of sponge to tip of handle. To use optional handle, remove regular handle and substitute with extension handle. * Soft, Absorbent, Horizontal Ribbed PVA Sponge. Patented grooves lift dirt and debris. No drip, no lint, floors dry almost instantly. Perfect for spills around the home or office. Safe on Pergo floors or laminates. Picks up pet hair like a magnet and rinses out cleanly. * 100% Pure PVA Sponge Doesn't Leach Its Color Like Other PVA Mops. You may find other PVA Mops on the market in colors like purple, blue, orange, or pink. Don't confuse them with The Super which is 100% pure PVA Sponge. Many of these so-called "PVA" mops may be a combination of cellulose or natural vegetable fibers and PVA sponge creating a poor quality of PVA sponge. Caution: Some of our competitor's don't take the time and expense to rinse out manufacturing chemicals and dyes. Result: Their PVA sponge mops will leave blue, purple, orange, or pink dye on your expensive floor! 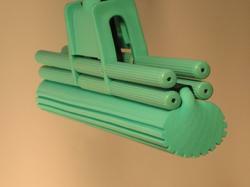 * Patented Gripper Holds Mop - Doesn't Slip Like Others. We get calls and emails every week from people who have purchased a competitor's PVA mop at a local home or garden show or discount store. The biggest complaint is that their PVA sponge mop slipped from the gripper! The Super has a patented gripper - it won't leave the PVA sponge slip. If it does - call us and we'll replace it for FREE! Choose from 3 Sizes of The Super PVA Mop: Jumbo 16", Standard 11", and Mini 7"
The 7" Pro Mini - Handy for small apartments, bathrooms, boat galleys, or cleaning window panes. Holds 8 ounces of liquid without dripping! The 11" Pro Standard - Perfect for homes, boats, RV's, and offices. Great for pet accidents or cleaning up after kids. Holds 12 ounces of liquid without dripping! The 16" Pro Jumbo - Great for larger kitchen floors, restaurant spills, or cleaning the side of your boat. Holds a huge 17 ounces (1/2 liter) of liquid without dripping! 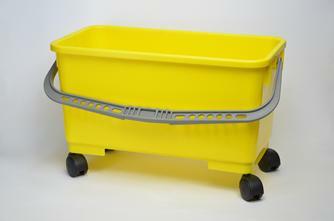 Don't forget to order The Super Bucket - perfect size for all three of The Super Pro PVA Mops. It has a removable dirt screen, casters, and optional bucket caddies. Holds 5.2 gallons. Thank you for the follow-up message on the mop I ordered. Yes, it did arrive in good shape, and it is everything I had hoped. Thank you for a well-made and effective product. Yes, we did receive the products and they are great!